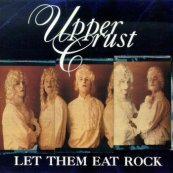 Get your Upper Crust (and related) CDs here! New! This double-live CD, recorded in the summer of 1999, captures the refined power and droll wit of a live Upper Crust performance. Includes many of your Crust favorites from the first two releases, plus classic live songs that have never been available before such as "Luncheon," "Everybody's Equal," "Matron," "We're Finished With Finishing School" and more! Released in Spring 2000. The most recent studio album; released in October of 1997. Includes "Cream Of The Crust," "Beauty Spot," "Boudoir," "Rabble Rouser," "Tell Mother I'm Home," "Versailles," "Vulgar Tongue," "Persona Non Grata," "Ne'er-Do-Well," "Gold-Plated Radio" and "Highfalutin'." 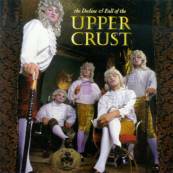 The Upper Crust's snooty debut, from the fall of 1995. Includes "Let Them Eat Rock," "Little Lord Fauntleroy," "Rock 'n' Roll Butler," "Minuet," "Who's Who of Love," "I've Got My Ascot 'n' My Dickie," "Old Money," "Friend of a Friend of the Working Class," "RSVP," "Little Rickshaw Boy," "Opera Glass," and the hidden track "Balderdash." New! Check out the new album by Boston's hottest surf-spy-lounge combo, Seks Bomba! Why is this listed here? Well, Seks Bomba just happens to feature one of your favorite Upper Crust performers. I can't mention his name, but his initials are Count Bassie. Fair Warning: if you're expecting something that sounds like the Upper Crust, don't bother. But if your mind is open and your tastes are varied, check out this ultra-cool album! Available now at CDnow! What's that? You haven't heard The Titanics?? You're missing out on some important music from the days before nobility. Lord Bendover and Le Duc d'Istortion team up using their civilian names in this historic slice of Boston rock. Buy it today!